I had never really noticed the name of John Burton Race until by chance I switched on the television one night to view a programme called French Leave. I was immediately a fan of the programme, not only because I love everything about France and its food, but because here was a programme presented by a new face with a refreshing new style. For me that programme was a great success so it was only natural that I would avidly await John's new series, Return of the Chef. As someone who has one great regret in life, that he did not train as a chef, I enjoy nothing more than seeing how it is done - so what a treat Return of the Chef has been. In fact enjoyment of the programme persuaded me that I should have a look at the book Coming Home, which accompanies the series. 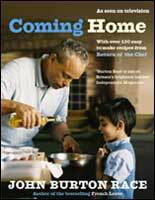 Return of the Chef is about the return of John Burton Race and his family to England from their year in France. The series is centered around his acquisition of the premises for his new restaurant known as The New Angel (formerly the famous Carved Angel restaurant in Dartmouth), its refurbishment, teething problems and day to day running all interspersed with bits of family life. I can't tell you what the food is like as I live too far away to have dined there but it certainly looks appetizing when you see it being prepared. The fact the restaurant has all ready been awarded a Michelin Star in the 2005 guide really says it all - when you consider that the guiding principal for all dishes to be served in the restaurant is the use of fresh local ingredients it is hardly surprising. The book follows on from this concept and talks about what there is not time for in the television programme - the style of cooking and the recipes. The recipes featured in the book are many and varied and fall into the main categories of restaurant style dishes, which you would serve for dinner guests, or family dishes which appeal to everyone. Make no mistake there is something for everyone inside the covers of this book. Discovering this was a pleasant surprise for me as I had expected to find a lot of difficult recipes glorifying the capabilities of a Michelin Starred Chef - it is very much the opposite. John Burton Race has written this book with his reader in mind. In his introduction John spells out his philosophy for the New Angel and explains how and why everything came about . . . "Some of the dishes included here are from The New Angel repertoire, others are personal or family favourites. But all of them are easy to make, and I hope there's something here for everyone". Each section has its own introduction with the nice touch of an opening quote. For example the opening quote for the Shellfish . . .
"Finding freshly caught shellfish just over the road was something I'd only ever associated with France . . . until Devon." or for the Meat . . .
"Roast Beef with Yorkshire pudding is a Sunday lunch favourite that always leads to a punch-up. Everyone wants seconds!" But what I also like about the introductory sections is the human family touches you find which make the book have a far more personal appeal. Summing up about Shellfish he explains that his wife cannot eat it and the children all hate it . . . "All very irritating because, as far as I'm concerned, there are few finer things in life than eating seafood that has been freshly caught, cooked and brought straight to the table." Very much my sentiments! When you start reading through the recipes, recipes like Grilled Langoustines with a Soy Vinaigrette, it makes you wish you lived near enough to dine at the restaurant, and if you could see the photograph you would certainly know what I was talking about. The book is beautifully illustrated throughout with some great photography. If you can't make it to the restaurant then this book is for you. The recipes are all easy to follow and within everyone's capability of producing. Have I got any complaints? Yes! I spotted the use of chervil in one or two recipes. I have not yet found a shop that sells fresh chervil - the professionals can buy it through their suppliers so why do the supermarkets not put it on their shelves?